This is a close-up of part of the one Aster tataricus I have in my garden. This is ironic, because this fall-blooming flower spreads readily and can take over an area before you know it. But, at my house it's different. The deer kept eating the new foliage, so I never got a flower where I had planted them years ago. In the spring, I moved several to a safe place behind some fishing line attached to iron arches. Only one plant shot up and bloomed. The others remain rosettes of foliage on the ground. "Just read your post. I think these are the asters to which you referred. These were planted by my mother-in-law decades ago, thankfully between a brick retaining wall behind them and the driveway. They are very aggressive but great when contained like this. Some years ago I discovered that cutting them back to about 3 ft around the 4th of July produced beautiful blooms on a more compact plant that requires no support. Otherwise they reached 6' and fell over. They bloom the whole month of Sept. and into Oct. and many passers by ask me about them." I also think of the huge expanse of these flowers in Liz Tedder's garden in Coweta County. Everything there is on a huge scale, so I'm sure she would be amused if she could read that I'm thrilled over only one plant. But that's the way it often is. A spring ephemeral will come up, last a few days and then vanish. Still, it's a joy to stumble upon a flower in the woods, especially one that has appeared for the first time. 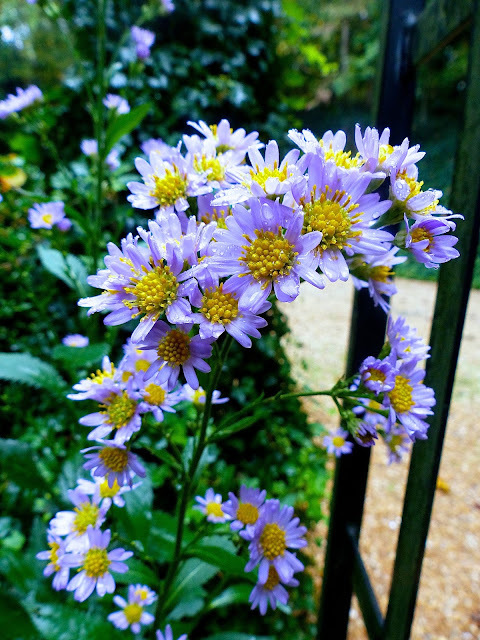 It is rather laughable that I have gone out every morning to admire this one aster slowly opening. But, it has been so much fun watching the stem shoot up and then seeing the little blue daisies unfurl. Whether they are in masses or come up as a single specimen, flowers provide so much pleasure and remind one of the miracles that can spring from the earth. It's damp and chilly in my house. The sun hasn't shone in about ten days. Still, there are no ruinous floods, so I am thankful to be where I am, and my sympathy goes out to everyone on the Carolina coasts and other affected areas. I took this photograph over Labor Day weekend when I stayed in Sag Harbor on Long Island, N.Y. 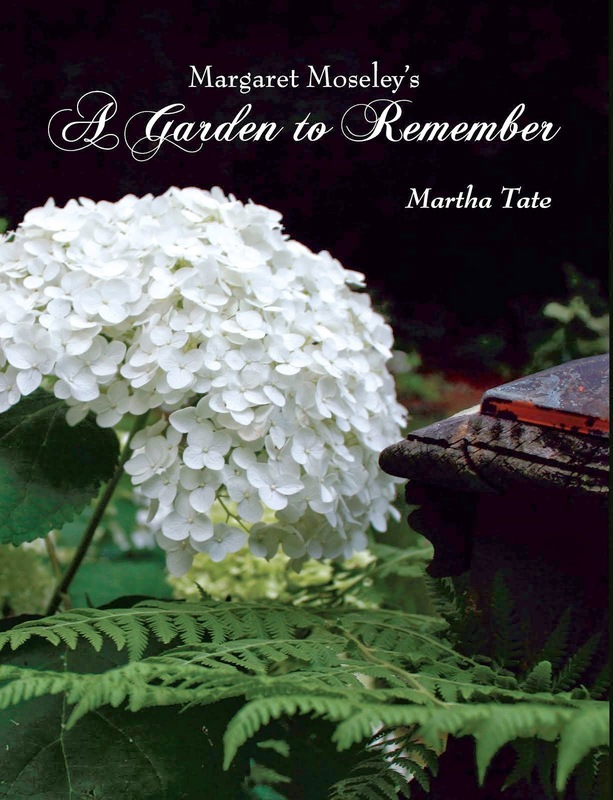 It was a great place to walk, and I loved seeing all the gardens - lots and lots of hydrangeas, and everywhere the last gasp of summer flowers, including the sweet autumn clematis growing on the picket fence. The rampant grower shown above has changed botanical names at least twice since I've been paying attention to such things. I think the latest moniker is Clematis terniflora. I'm going with the Missouri Botanical Garden on this one. This is a very invasive vine. It has gotten loose along the banks of the Chattahoochee River. Still, it has its charms. I've loved having it clamber up onto my clipped shrubs, visible from the library window. But somehow this year, it was cut at the base, so I had nothing but the brown, crunchy remains from last season. I suspect the deer had something to do with this. The vine is just a memory now. It blooms in August here in Atlanta. It was at its peak on Long Island over Labor Day. I'm now concentrating on fall plants and looking out at my one remaining Aster tataricus which is behind some fishing line that is rigged to keep the deer away. The one tall flower with light blue flowers gives me so much pleasure. I'm going to figure out how to have armloads of these for cutting next year. In the spring, I moved the few plants that had survived the marauders, but only one shot up and bloomed. I still have the rosettes of foliage of the ones that just sat there. I hope to be able to clear out the one semi-sunny strip I have at my house, wrap it around with the fishing wire Sharyn Altman put me onto and have some flowers to cut by next spring and summer. I do have some of the above clematis coming up, so I can train some up a tree in the protected area. It has to be cut back in winter, as the foliage dies and crisps up and is not a pretty sight. Back to the scene above at a cottage just across from where we stayed. I am remembering this mild end-of-summer day in a beautiful place. Even though it's gray and misty outside, I love looking back on sunny days that I know will soon come again.